So the old saying goes, every cloud has a silver lining. So too it seems does the rather large cloud hanging over the EU as a result of the Irish No vote on the Treaty of Lisbon; the silver lining in this case is an Irish writer called Jason O’Mahony. 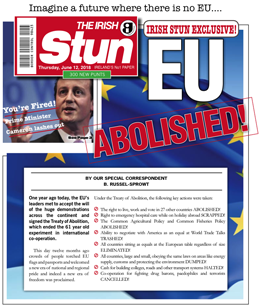 O’Mahony produced the Spoofer’s Guide to the Treaty of Lisbon that I’ve previously posted about, and now he’s sent me his lastest production The Irish Stun, a counterfactual newspaper dated 2018 one year on from the EU being abolished and the problems that would cause Ireland. It’s used by European Movement Ireland in a drive to recruit members, and the e-mail introducing it says “You know, the European Union is like dry Weetabix. You know it’s good for you, but it’s just tough to get through.” Quite true. It’s hard to make the EU amusing and at least in Ireland people seem to be trying!